Motorcycle Riding Techniques for Dangerous Situations Revealed in "High Risk Motorcycle Riding"
Here's information you can put to good use to ride smart and well prepared when you're on the road and the going gets tough. Every motorcycle rider looks forward to traveling in bright, balmy weather on clear, safe, enjoyable roads. But you know riding conditions can't always be perfect. At times they can get extremely risky and uncomfortable -- downright dangerous. And you need sharp motorcycle riding techniques to deal with such situations. Even on a good day, you can't consider motorcycle riding a "safe" pastime. Quite unexpectedly, you may find yourself traveling in the rain or cold, at night or across long distances -- maybe all at the same time. You've got to be ready with the right motorcycle riding techniques to deal with dangerous, high risk road conditions and unexpected obstacles in your path. Here are motorcycle riding techniques and reliable information you can use to prepare for difficult riding situations. 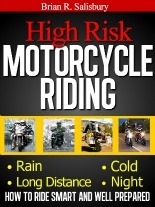 "High Risk Motorcycle Riding" will help you to travel smart and stay comfortable when riding gets really risky -- particularly when you're traveling in wet or cold weather, after dark or hammering out long, grueling miles. Motorcycle riding in the rain…. Get the information you need to prepare yourself and your motorcycle to ride smart and comfortable in the rain and cold, at night and across long distances. Benefit from this experienced rider's many years and thousands of miles of motorcycle riding and equipment-evaluation experience. Use this book to help you to prepare for and overcome the most dangerous riding conditions.